If you’ve played a previous version of the translation patch, this version won’t seem very different at all, but it felt like it was time to release what we had rather than sit on our fixes and improvements forever. On top of that, we’ve also released a set of files and tools that fans can use to translate the game into other languages! You can download the tools and read all the documentation here. It’s important to note that these tools have limitations and aren’t user friendly. So be sure to read through the documentation first! We had some cool guests join us for a few of the days, so if you’ve ever wanted to know more about the translation or know more about obscure stuff in the game, check it out! No, you need to apply the patch to a Japanese ROM. I can’t believe it’s been 5 years since 1.1. Thanks for this update! Sweet, I’ve been in need of any excuse to play MOTHER 3 again! Thank you for the update. I’m now playing it on my PSP. Cool! Just downloaded it… I’ll be playing it very soon!. Gonna try to fill the Battle memory to the max this time, all the enemies and front n’ back sprites… It won’t be easy. But I will do my best. By the way, I was checking the tools and files, just felt curious about them. I noticed the voice files have their names changed… It says that the “lookoverthere” one is for the Rock-Paper-Scissors scene and the “readysetgo” for the Made-you-look. That was a mistake… Or is that how they are actually named? An E and two 8: Oops, that was just a typo in the documentation, I’ll fix that. Slightly unrelated, but I was just curious. I have an interesting glitch story. I was once messing about with cheat codes, so everyone in my party had infinite HP and PP, including Duster and Boney. When I got to the part on the mountain, I got in a battle, and the battle text box filled up with with the kana for “a” and then the game crashed. Was that a glitch you’ve ever encountered, and do you know what causes it? I have no idea what would’ve caused it, but using cheat ANY codes with Mother 3 is basically asking for bugs to happen eventually – even codes that seem to work most of the time just fine. Is there anything in this patch that your really glad to see fixed mato? You thought I was a fool. That I wouldn’t really follow through with it. You thought I’d never intend to, or indeed have the capacity to, release “my own version of Mother 3”. By the way Mato, you mentioned you were working on an official GBA game translation (would love to know which one btw :P) and you received NoA’s lot check and guidelines for stuff like “Press the B Button” and things like that. I was involved in a minor way with proofreading a secondary language translation for some obscure licensed game (think like a beta-tester that also was re-writing awkwardly translated text… for free out of fan enthusiasm, but credited -that’s experience, at least) but I had obviously to leave the control explanations untouched (interestingly, they said that outside CJK/Multi5/Russian, NoA/NoE doesn’t have any QA covering this (yet?) and thus doesn’t care)… This detail has been bothering me ever since. Do you mind sharing (or pointing where I could find without being necessarily involved in developing a game) what sort of guidelines are required by NoA (or any other publishers) for such details (if that doesn’t fall under some sort of NDA of course or causes you trouble)? Mac: Mostly I’m just glad to have it out, it’s been weighing on me for years and people have been asking for it for a long time. And it’s nice to get the tools out there so we don’t have to offer continual support ourselves. I thought Mato said a long time ago is a minor bit of a Nightmare Before Christmas game. Not sure if this has been addressed before, but are you planning on doing a comparison between the original game and the translation ala your Mother 2 vs. EarthBound articles? I’d love to see what differences, if any, exist between the two. I’ve been a fan of Mother for years now, and I was so hyped when I saw the translation tools coming out. I translated some of the text and made the test.gba to see how it works. However, even though I followed all the instructions carefully, all the game text is just nothing but $ $ $ $ $ $ $ $ $ $ $. Anyone knows how to solve that? P: Be sure to read the documentation carefully – your question is actually on there: http://mother3.fobby.net/tools/#questions It also includes a link to a message board specifically for tools issues. Off the top of my head, though, it looks like you just haven’t translated all of the text. Once you’ve translated the text it will start working properly. I’d love to play this game. But how can I? 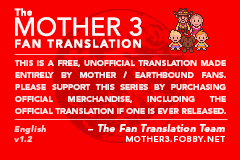 Erm, maybe I’m completely wrong, but could the translation tools be used to change the text the characters are saying, like if you wanted to make a hack of Mother 3? Yeah, you can use them to change the text that people say but you can’t really change much besides that. 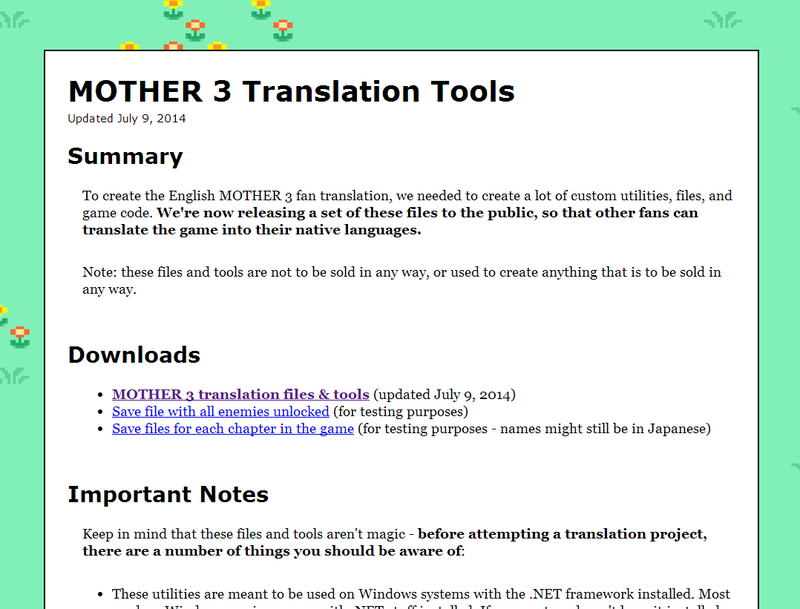 I know it’s a bit unrelated but I just downloaded the Mother 3 translation patch. But I don’t have anti virus. (I’m on dial up still..) So i was just curious is it a safe download? Do I have anything to worry about? As far as I know it’s safe and virus-free. I compiled the latest version of the Windows patcher myself, but I’m not sure which patcher you’re using. If you’re worried, some emulators have automatic UPS patch support, which means you don’t need to patch anything yourself – you can just use the .ups file inside the .zip file here. But you’ll need to read your emulator’s documentation about it and how to use the .ups file and all that. I just downloaded the patch from your website Mato. I tried it today but it said “The application failed to initilize properly (0xc0000135)” when i clicked on the exe for your patcher. It was the Windows version I tried as my computer that i have it on was Windows XP. The .ups file in the translation .zip file is the actual patch. Use it and a UPS patching program since the patcher I provided in the .zip file doesn’t work for you. Thanks man. And if that doesn’t work I guess I’ll learn Japanese lol! I know you will erase this comment..but could you add”Auto Fight”? That’s not really a translation hack or a bug fix or anything, so no. But if anyone out there wants to take a stab at it they can I guess.